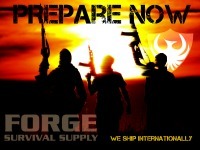 Knowing when to transition from rifle to pistol is another of those subjective determinations. The rule of thumb is 25 meters/yards. Outside 25 pistol accuracy is considered generally marginal and there is "enough time" to reload the rifle. Inside 25 the threat is more immediate and there is little or no time to work the rifle and a transition to a working, loaded weapon is preferred. When you should or shouldn't transition is entirely dependent on the situation. Like the "Up Drill," this section will address considerations of the transition and not a step-by-step walk through. Of course, all the steps of the Draw are contained within this drill. Addressed as they appear in the process. The rifle has stopped working at a crucial moment. You don't have the time to diagnose the problem. All you know is, "I need to keep shooting right now." Slinging a weapon in an unknown configuration is never a good idea. Gear tends to do the craziest things when you don't want it to. Instead of taking a chance on an Accidental Discharge (AD), get in the habit of throwing the selector lever back to safe. 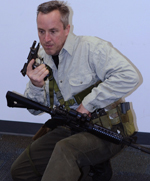 When the rifle is slung it puts the magazine right in line with the pelvic region. If you drop the weapon you are taking a chance on negatively impacting your draw. The first method of control is riding the rifle down. 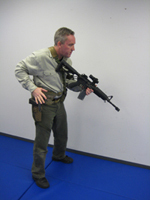 The support hand rotates and lowers the rifle out of the way. As the rifle is being lowered the firing hand is starting the draw. The second method of control is "Trapping." The firing hand rotates the side of the weapon to the body. The support presses against the stock to keep the weapon in place. Note the support hand is in position to meet up with the pistol at Position 3. The weapon is released when the pistol reaches Position 3 and slides harmlessly down the body. Neither method is more correct than the other. The draw should proceed as normal. Of course, after your transition, the rifle is now in the way of just about everything you need. When standing it isn't that bad. 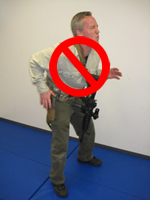 But if you are crouched or kneeling behind cover it becomes more of an issue. If you have transitioned to pistol you may need to stick with it for a while. Think about where your pistol magazines are stowed in relation to where the rifle will ride when slung. Many people practice transitions while standing. 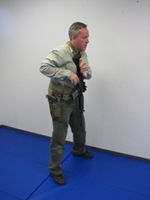 Not so many practice an Emergency Pistol Reload while kneeling with a slung weapon.